Young Indians prefer receiving online gift vouchers instead of traditional gifts, new shopping survey shows. Young Indians’ gift of choice is changing with the rise of e-commerce. 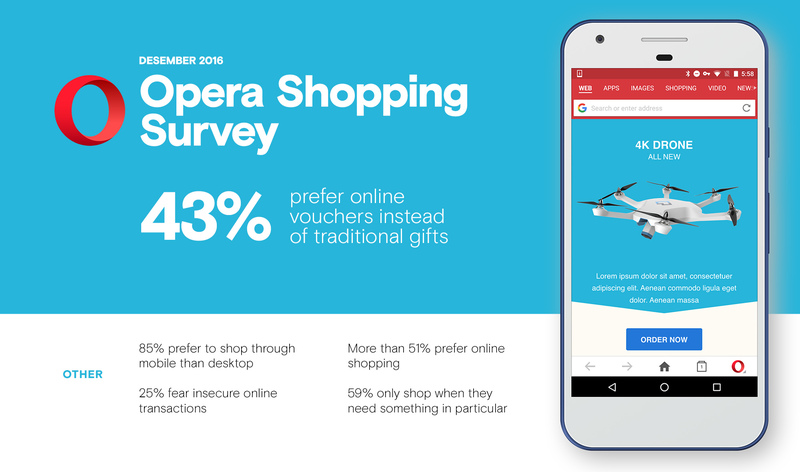 Almost half of the people asked in a survey by Opera said that they preferred getting an online shopping voucher, compared to one third that said they would prefer a gift selected by the giver. Mobile first seems also to be the description of e-commerce in India, as some 85% of those surveyed used specific shopping apps or a mobile browser to shop online. Only 15% preferred to use their desktop or laptop, a number that is significantly lower than in, say, the U.S. where desktop still accounts for more than two-thirds of all e-commerce sales. The findings are released in a new shopping survey done by browser maker Opera. “Online shopping has become popular due to the increasing usage of smartphones, roll out of high quality networks, and the ease of access and convenience of having goods delivered to your doorstep. Opera today has over 75 million monthly users in India and we see that e-commerce is one of the top categories of content viewed by Opera users,” said Sunil Kamath, Vice President – South Asia & Southeast Asia at Opera. While more and more Indians love to shop online, as many as half of the respondents are concerned with the risk of theft while shopping online, apps crashing or are put off by unwanted pop-up advertisements. These known downsides to online shopping are mitigated through the use of the Opera apps, such as Opera Max and Opera Mini. In Opera Max’s privacy mode, data is always encrypted and anonymized, as it provides an extra layer of industry-standard TLS/SSL protection on top of whatever the shopping app does or does not offer. Also, for the 25% of users who are concerned with slow internet connection or fear they will run out of data while shopping, Opera Max can help. Opera Max reduces the amount of data users consume while shopping through popular shopping apps, such as Flipkart, Shopclues, Myntra, Amazon and Snapdeal, by as much as 60%. The Opera Mini browser compresses data by up to 90%, which ensures faster loading of images and webpages. Shoppers can use the browser to research products on several shopping sites at the same time without opening too many apps that may cause app crashing. They can also get rid of unwanted advertisements by switching on its ad blocking feature. Interestingly, Indian shoppers now prefer using the internet to do research prior to shopping. 70% of respondents said that they check out apparel and electronics products online, compared to 30% of people who check out products in a store. 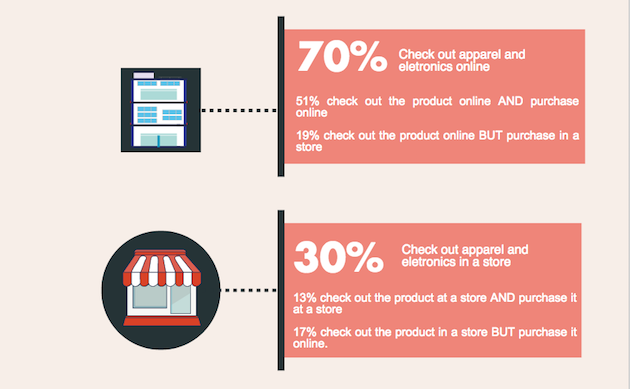 Almost half of the respondents said that they not only check out these products online, but also shop online. While e-commerce has come a long way in India, it’s good to see that Indians are still very responsible shoppers. 59% of respondents only shop when they need something in particular, as compared to 22% who set themselves limits to resist ´shopping online. One out of 10 Indians also either wait a few days to let the urge die, or ask their friends and family to stop them from over-spending. Information contained in this report is based on the responses to the questionnaire shared on Opera’s social media pages on Facebook and Twitter. Over 1,500 participants, from 30 cities across India and in the age group of 16-55 years, shared their shopping preferences. 70% of these respondents were in the age group of 19-30 years. 60% of the respondents are from the top five metros: Mumbai, Delhi, Bangalore, Chennai and Kolkata, while the rest are from the tier 2-3 cities. 55% of the respondents were women and 45% of the respondents were men. To test the data savings across shopping apps, we downloaded each app onto a Micromax Canvas 6pro smartphone, turned Opera Max’s data savings feature on and went through various products categories using keywords like ‘smartphone’, ‘Samsung smartphone’, ‘smart television’, ‘Micromax television’, ‘formal shoes’ and ‘phone covers’. We browsed through the top five products that were listed under each keyword and examined the results on Opera Max. To get the most accurate results, we conducted this test five times over a period of one week.